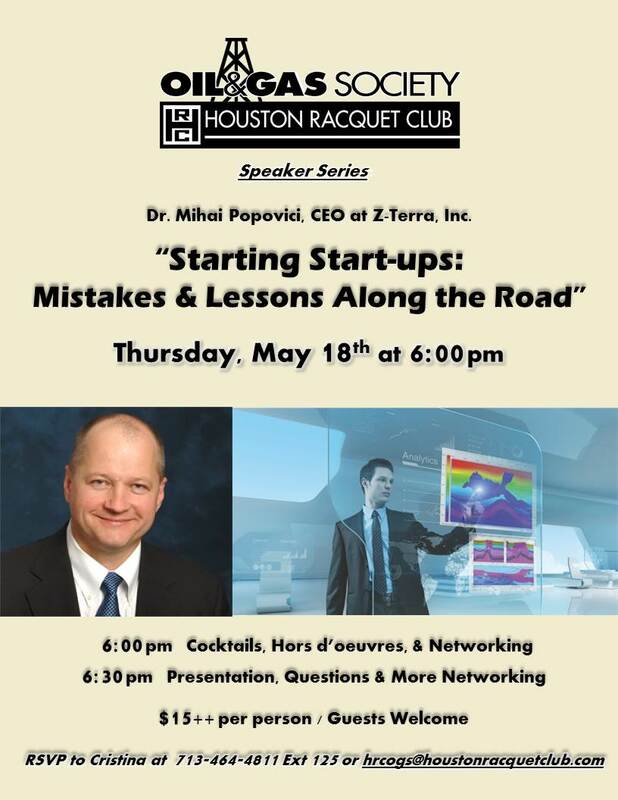 Please join us for the Houston Racquet Club Oil and Gas Society Speaker Series on Thursday, May 18th at 6:00 pm. We always have a crowd to hear our speakers, so please sign up as soon as possible so we can plan accordingly. RSVP to Cristina at 713-464-4811 Ext. 125 or hrcogs@houstonracquetclub.com by Friday, May 12. Alexander Mihai Popovici is Chief Executive Officer and Chairman at Z-Terra Inc., a provider of state-of-the-art geophysical and geological technology, services and software for the upstream oil and gas industry. He holds Ph.D. (1995) and M.Sc. (1991) degrees in geophysics from Stanford University, and an equivalent B.S. (1985) in geophysical and geological engineering from University of Bucharest, Romania. He escaped from Romania in 1986 and spent a year in a refugee camp in Austria. Dr. Popovici was co-founder and CEO of 3DGeo Inc. Dr. Popovici’s industry experience includes work in the seismic processing research department for Halliburton Geophysical Services in Dallas and Houston, and EM acquisition and processing in Romania. From 1987 to 1983, he was employed at Guzik Technical as a staff engineer for magnetic recording and software development. He has nine patents in the field, over 100 publications in conference proceedings, books, trade journals, and research reports and has given numerous invited talks at conferences, geophysical associations, and geophysical workshops. He has been a member of the SEG Research Committee, served as Associate Editor (Seismic Migration) for Geophysics, and is past Chairman and founding board member of Geoscientists Without Borders, an SEG Foundation program that funds humanitarian applications of geophysics around the world. Currently he serves on the SEG Foundation Development Board and is the 2017 SEG Houston Technical Program Chairman. Popovici is active in the community; he was president of Casa Romana, a non-profit organization serving Americans of Romanian origin living in the Bay Area. He was elected to this position in 1997 and built the largest Romanian community center and church on the West Coast. Casa Romana was dedicated in 1998 by the president of Romania Emil Constantinescu. At present he is Honorary Consul of Romania in Houston. Dr. Popovici and his wife, Catherine, have four sons and one daughter. Together with Catherine, he established an SEG scholarship endowment fund that provides scholarships to students. He is a scuba diving instructor, active fencer, and played paintball with one of the first established pro teams. Today, he mostly plays with his kids, practices karate, rock climbs, hunts, and is working on his private pilot license.